When Vietnam veered onto the capitalist road a quarter century ago, there was hardly a hint of pushback by the officials and apparatchiks that had, until then, been entrusted with the enormous – and futile – task of building socialism. To the contrary, many enthusiastically set about to exploit the opportunities that doi moi, or reform, brought to hand. It turned out that one of the surest routes to wealth in contemporary Vietnam lies in expropriating farmers and converting farmland to more immediately profitable uses. In January of this year, the attention of the nation was riveted by two stories with that theme. The first, beginning on Jan. 5, concerned a sensational shootout on the outskirts of Haiphong City. The incident, which is discussed in part 2 of this three-part series, followed local authorities’ demand that a fish farmer surrender land that he and his family had reclaimed and made profitable after 14 years’ hard work. Some reports say the tract was under consideration as the site of a new airport. The second story, reported on Jan. 20, concerned the end of a three year effort to put Tran Ngoc Suong in jail, allegedly for embezzlement but, it seems well-established, actually for resisting the takeover of her flourishing agribusiness venture, the Song Hau Farm. Land conversion was what the Party brass in Can Tho City and nearby Co Do District had in mind when in 2005 they proposed to take over the Song Hau Farm. With the cooperation of Korean and American investors, they planned to build a ‘new town’ bordering the city’s planned modern airport on the former collective farm’s 4000 hectares. First, however, they had to deal with Tran Ngoc Suong. Suong, then 56, had been director of the farm for seven years. Before that, she was chief assistant to her father, a demobilized Viet Cong officer who had been assigned in 1978 to create a collective farm from a vast expanse of swamp deep in the Mekong Delta. The success of the father-daughter team in the endeavor is legendary in Vietnam, one of the few brilliant achievements of the grim years following the end of the ‘American War’ and the nation’s reunification. By 2005, the Song Hau Farm was selling rice and fish profitably to home and overseas markets. Though reconfigured as a joint stock company in 1991, the farm had remained remarkably true in important respects to its founding ideals, providing reliable income and social services for some 3000 farm families. Suong wasn’t going to let them down. “[Song Hau] is the last true example of agricultural production following socialist principles,” Suong says she told the local Party chiefs at a meeting in October 2007. “I personally have never taken a penny that wasn’t due me. You call me ‘behind the times,’ comrades, too backward to lead such an enterprise. Well, I’m ready to hand over leadership to the people I’ve trained over the years. Can Tho’s power elite wasn’t a bit concerned by the social costs that Suong foresaw. Perhaps they reasoned that the dispossessed farmers could find work in the new factories or on the golf course they expected to spring up on the former rice paddies and fish ponds. And they had a Plan B. If it’s deemed necessary to punish someone, Vietnamese law provides any number of possibilities. A staggering number of activities are technically illegal but routinely tolerated because to enforce the law would cause the system to freeze up. However, they can be invoked to force a dissident into line. In September 2008, Suong was indicted in the local Co Do District Court on charges of embezzling 9 billion dong (US$428,857 at current exchange rates) from Song Hau Farm. When the case came to trial in August 2009, she was convicted of running an illegal slush fund and sentenced to eight years in prison. Four subordinates drew lesser terms. Suong appealed. 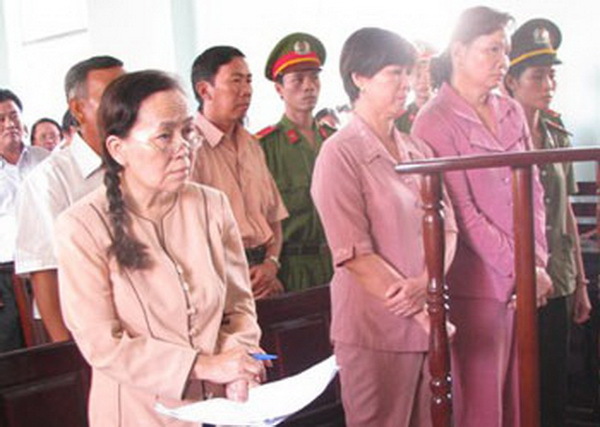 The appeals court in Can Tho City upheld the lower court’s verdict. When it looked as though Suong might actually serve time in prison, her case became front page fare in Vietnam’s national press. A platoon of aging revolutionaries, prominently including Mme Nguyen Thi Binh, once the Viet Cong foreign minister, rallied to Suong’s defense. Supporters argued that setting up an unreported fund for social welfare purposes was an entirely ethical way of dodging red tape and in any event, was not illegal when it was established many years earlier. Moved by photos of the frail but unbowed Miss Suong in the dock, public opinion was overwhelmingly on her side. In Hanoi, impatience with the Can Tho authorities was manifest, the center’s typical reaction when the actions of ham-handed local officials stir up public unrest. In May 2010, after central prosecutors found procedural violations, Vietnam’s Supreme Court threw out the verdict. Seemingly unfazed, in February 2011 the Can Tho Police reported that further investigation had found fresh evidence pointing to Suong’s guilt. In August, prosecutors filed updated embezzlement charges against Suong and her subordinates. Suong’s friends did not give up. Their chosen instrument was Vietnam’s ‘Fatherland Front,’ a Communist Party-dominated amalgam of groups that purports to ‘represent the entire people.’ On the heels of the new indictment, the Front urged administrative remedies for Suong’s wrongdoings, if truly there were any.